Aircon not cold can have a few related issues, but primarily goes to cleanliness. 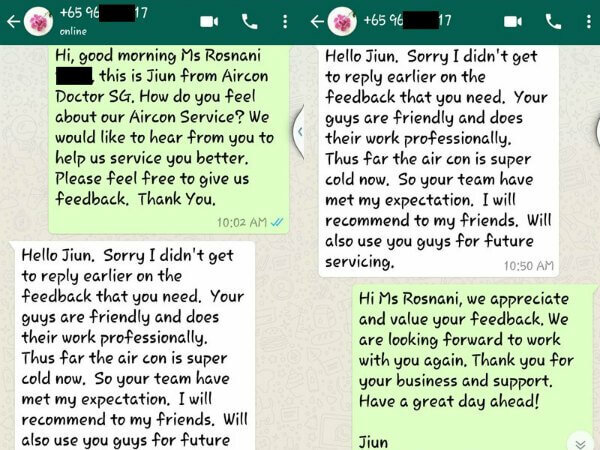 A customer, whom we provide our service in Tampines, would share her experience and us as the recommended aircon servicing company. All her 3 Daikin air conditioners did not produce cool air last May and it would be getting hotter towards June in Singapore. She scheduled an aircon inspection for us to see what we could do about it. We had some customers that would start asking for aircon gas top up every time they experienced an ‘aircon not cold’ issue. Aircon refrigerant plays a part on the cooling process. However, they could be less efficient if the cooling process are clogged by the filthy evaporator coil and less heat transfer can be made. More electrical power will be needed to cool till the desired cooling temperature. In other words, higher electrical bills due to more electricity wasted for cooling the same area. In the long run for exerting more power on cooling, the air conditioner eventually worn out faster than usual. Aircon repair cost is always high as the air con spare parts are already expensive when they come from factories of all brands and models. Our labour cost for aircon repair is the minimal compare to the air con spare part cost. It makes logical sense to have the air conditioning system checked for ‘aircon not cold’ issue. Our aircon technician will do an inspection and advise the appropriate action to be taken. We found out that all the Tampines customer’s air conditioners were dirty and we recommended our aircon chemical overhaul service. The aircon gas top up is also included in that service. After the aircon overhaul was done, the customer was happy about the refreshing cooling brought by her Daikin air conditioners again.